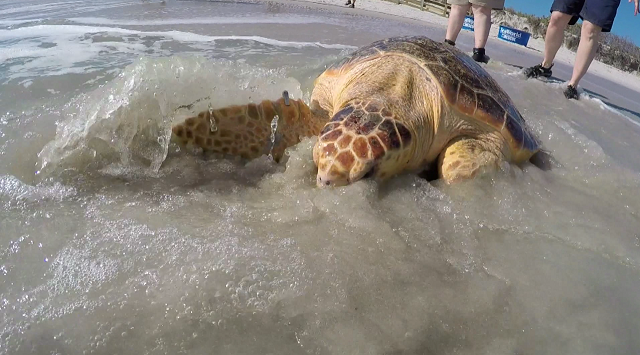 BREVARD COUNTY, Florida - After several months of specialized care, four loggerhead sea turtles are back home in the ocean thanks to SeaWorld Orlando’s Animal Care Team and Florida Fish and Wildlife Conservation Commission (FWC). The turtles were released Wednesday morning at Canaveral National Seashore in Florida. Three of the Loggerhead Sea Turtles arrived at SeaWorld Orlando last December after flying across the country from Massachusetts. During the winter months, sea turtles are susceptible to “cold stun” from the frigid northern water temperatures. The New England Aquarium in Boston sent 19 rescued sea turtles on a flight to Tampa for rehabilitation. SeaWorld, along with several Florida marine life organizations responded to help care for the animals. Upon arrival at SeaWorld, the sea turtles were given antibiotics and treated for mild pneumonia. The fourth turtle arrived at SeaWorld from the Whitney Lab for Marine Bioscience in St. Augustine late last May. Upon arrival, the sub-adult Loggerhead was emaciated, lethargic, and covered in barnacles. After eight months of fluid therapy and digestive care at SeaWorld, the turtle made a full recovery.